This is the third year for Xavi Fores inside the highly respected Barni Racing team, but the first in which he is showing such high levels of consistency, even against the top factory bikes. The top independent rider, by far, and beating masses of official entries from other manufacturers. Even his own - again. He was third in race one, but looked like a potential winner early on. 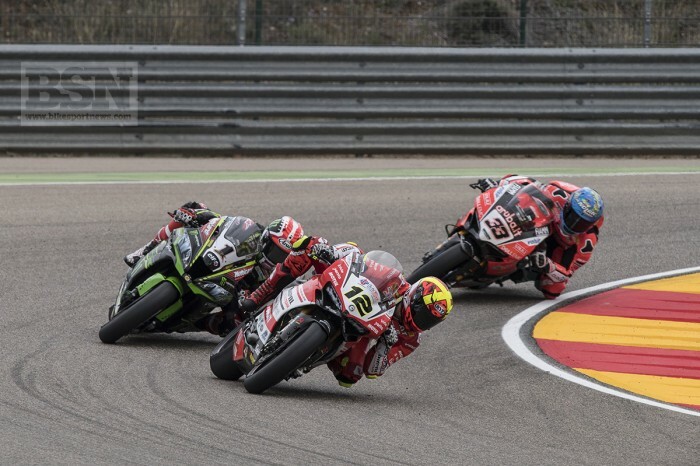 A home race in Spain was easily the best motivator for Fores at Motorland, for people looking from the outside at least, but Friday was a relative nightmare. Race one was even shaping up that way after choosing a hard rear tyre for a race that was eventually red flagged and then restarted. “Before the red flag I felt so bad on the bike because I was riding with a hard tyre on the rear and losing a gap a lot,” said a relived Fores from behind the new paddock show podium. “So I decided after the red flag to go all in, like in poker, and put the soft rear tyre on in order to be more competitive. It was hard to understand because I did not test it before in a long run, because the practice weather was a bit difficult. When I was riding and leading the race I had a good pace. His Friday was hard because he had his bike set up all wrong, in a manhood-worrying way, according to his comic comments. His better choice softer rear tyre eventually went off enough to be caught and passed by Davies, but third was another over-performing group effort from a privateer. And his team is an independent one as far as ownership and funds go, but also an integral part of the overall Ducati effort.